Started off with a seminar and workshop for the new edition of Dungeons and Dragons. I’ve never actually played D&D, though I’ve had a few experiences with D20 gaming which have been… not entirely positive. Whilst listening to the presentation leaders talk through the changes of the new edition, I was impressed and intrigued, though without knowing the old versions of the game I didn’t have much to compare to. When I actually sat down to do sample character creation though, my experience was pretty demoralising. This game needs its own glossary: apparently “hit dice” and “armour class” mean recovery roll and defense value, though why they’re not called that I have no idea. The last half an hour was set aside for the character creation workshop, but after twenty minutes of frustration I just left to do something else. It’s be unfair to value the game by this experience alone though: games need to be played to be judged, so I’m not going to criticise D&D when I hadn’t even read the character creation chapter first. I was scheduled to attend another 13th Age game, but as I mentioned last night, the plan was to skip it so I had time for everything else I wanted to do. This is one of the problems of roleplaying at GenCon – people sign up for events months in advance, everything sells out, and no-one knows whether they’ll actually want to play when the weekend rolls round. The result is lots of dropouts, and when me and my friend turned up to grant our GM the courtesy of explaining our absence, we discovered that none of the other four players for this sold out game turned up at all. I felt bad for our GM, but he had at least run five other games at the con, so one game cancellation on the last day probably wasn’t the end of the world. With the extra two hours picked up from the cancelled game, I made one last pass through the exhibition hall. This gave me the chance to purchase Weird Wars Rome, get a few gifts for friends, and demo Star Wars Armada. The demo was fun, but brief, as I had to cut things short to head off to my last event. 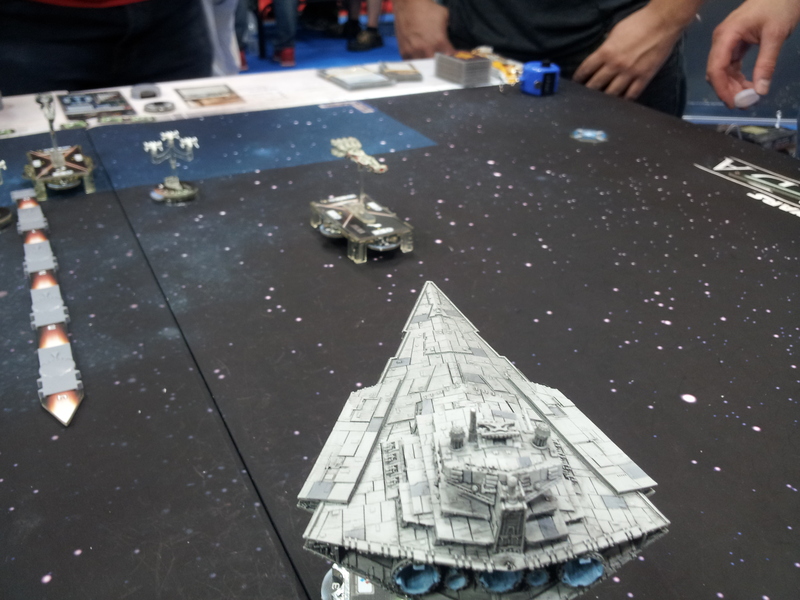 My mighty Star Destroyer bearing down on a dinky Corellian Corvette. The turn after this photo was taken, I fired with maximum firepower and followed up with a ramming maneouvre, tearing the ship to pieces. Die Rebel scum! Finally, I paid a visit to the Indie Games on Demand stall, where I ran a game of Monsterhearts. This was lots of fun, and I’m very grateful to my players for their imaginative roleplaying, considering how exhausted they must have been at the time. Running a game in two hours is something I’ve never done before, and it was interesting to handle that challenge. By which I mean I finished half an hour late. Oh well. Phew! Well, all good things must come to an end. I’m sad that GenCon is over, but also too tired to register emotional input (which is good?). Thanks to everyone I played with over the four-day weekend, and all those who made the convention happen. This might have been my first GenCon, but it won’t be my last.